This was the second of two D'Oyly Carte recordings from 1964-65 led by Sir Malcolm Sargent, his final contributions to the field, in a career that had begun in the 1920s. 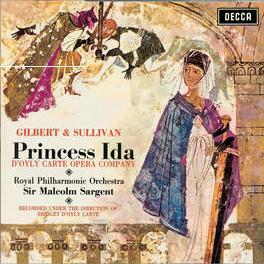 Of the G&S operas in the D'Oyly Carte repertory at the time this recording was made, Princess Ida was the only one not included in Sargent's "Glyndebourne" series for EMI. This recording, thus, gave Sargent a chance to fill the a significant gap in his personal discography. As he had done with the 1964 Yeomen, he brought Elizabeth Harwood to the lead soprano part, even though she had no D'Oyly Carte experience in this or any other role. Ann Hood, D'Oyly Carte's stage Ida in 1965, was demoted to Lady Psyche, while the regular Psyche, Valerie Masterson, was demoted to Melissa/Sacharissa. Masterson, by the way, would often play Ida herself later on, so this recording in effect boasts three Idas. Elizabeth Harwood is not a good Ida, and it is difficult to see why she was allowed to record the role. Neither John Reed nor Kenneth Sandford equals their earlier counterparts. Many listeners find this recording a disappointment. Sargent had a lifelong preference for slow tempi, and this tendency got more pronounced the older he got. (Compare his interpretation of "The woman of the wisest wit" in this recording to his tempo on the 1932 recording, for example.) Incidentally, the recording is notable for retaining the wording, "the negroes they'll be bleaching…," a remarkable solecism for 1965. The Sargent Tempos in 1965 are almost perverse: the fastest "Sing hoity toity" and the most clangerous (this is probably not a real word) three brothers. Throughout I feel that Sir Malcolm was trying to oversell all his points, unlike his '32 Ida. I think that Michael Walters is too critical in his review of the 1966 Princess Ida. For me, the sound qualitiy alone is enough to recommend it: it is an example of Decca engineering at its best with an orchestra on top form perfectly balanced with chorus and soloists. Also, D'Oyly Carte had the sense to restore the female chorus to the end of Act One for the recording. It was the practice at the time for the women to exit after "Oh dainty triolet" in performances because it was felt unseemly for ladies to sing about military drums and such stuff! Also, it is unfair to say that Sargent's tempi are too slow. I saw a D'Oyly Carte performance in 1978 (obviously without Sargent), and tempi were just the same. 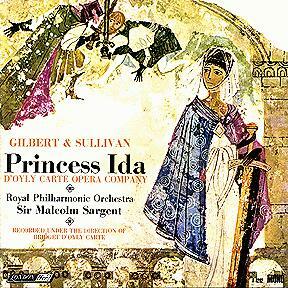 Few G&S operas have been recorded less often than Princess Ida. This is still the only professional stereo recording. It has been re-issued on CD with Pineapple Poll, a 1983 recording with the Philharmonia Orchestra conducted by Sir Charles Mackerras. LKA 4708/9 The catalog numbers containing 'A' are Australian pressings. LKA 4845 Highlights. The catalog numbers containing 'A' are Australian pressings.